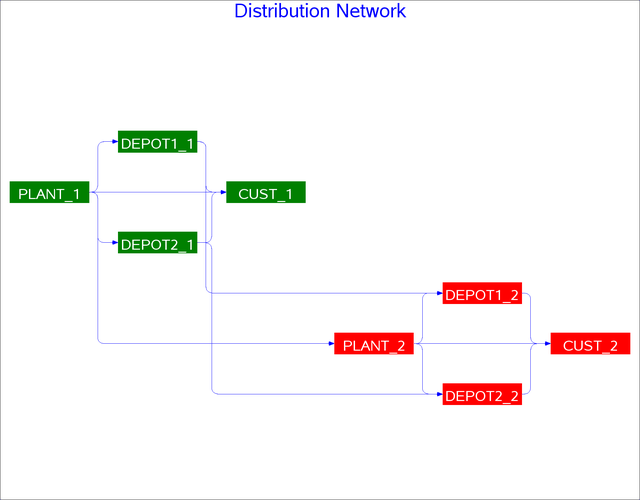 Suppose that you want to use PROC NETDRAW to draw the network corresponding to the preceding network flow problem and suppose also that you require the nodes to be placed in specific positions. The following program saves the network information along with the required node coordinates in the Network data set ARCS and invokes PROC NETDRAW to draw the network diagram shown in Output 9.14.1. The Network data set also contains a variable named _pattern, which specifies that pattern statement 1 be used for nodes relating to period 1 and pattern statement 2 be used for those relating to period 2. Note: This network diagram can also be drawn by using suitably defined ZONE and ALIGN variables.